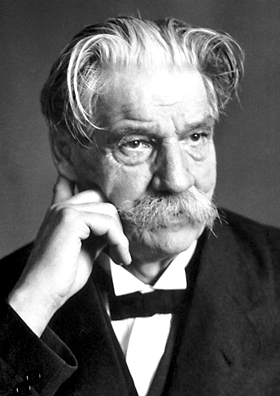 Albert Schweitzer is too much forgotten! I won’t bemoan the likely reasons here. Rather, I’ll do my little part on behalf of what his study and life-work can yet mean to us… both detailed learning and inspiration toward the difference a life dedicated to the welfare of all can make. The book is his last published one (manuscript completed 1951, when he was 76, but not published until 1967/1968 – in German and then English, after his death in 1965). I highly recommend it for anyone interested in a number of related areas. Probably most universal of these would be the teachings and personal beliefs of Jesus and Paul. Particularly beliefs that relate to what was central for both of them, the Kingdom of God. The English title is apropos: The Kingdom of God and Primitive Christianity. 1. Schweitzer himself had, nearly half a century earlier, noted and popularized the concept that scholars as well as lay people tend to cast Jesus in the form of their preferred image of ideal humanity, ethics, social action (or inaction), etc. He rightly pointed out (in The Quest of the Historical Jesus, 1906) that you can’t honestly deal with the “historical” (or the spiritual) Jesus unless you see that he was focused on proclaiming and preparing for the immediate arrival of a supernaturally instituted Kingdom of God revolving around Judea and Galilee (area of Israel’s earlier Northern Kingdom). In other words, the subject matter of our reviewed book as well as his much earlier related one is crucial for any educated person in countries heavily influenced by Christianity. 2. The writing style of the book I found very agreeable, flowing. His chronological and thematic approach creates the sense of a story that is fun to follow. And it is not theologically or historically technical in terminology or background needed. He makes few scholarly references although a reader well informed in biblical studies will realize just how much deep scholarship is behind the text. Particularly conservative readers (theologically) will not always agree with him, nor will many more liberal ones, which Schweitzer certainly knows. Yet he does not labor to prove his case on points of potential controversy. He does what I think works well for the broadest swath of his likely readers…. He strikes the balance of explaining backgrounds and his reasoning, with brevity, and moving the story along from key point to key point. While it was easy reading, I also noticed that some re-reading shows just how packed it is with history and the development of ideas — more than can be retained initially. This is in addition to the copious amounts of Scripture Schweitzer quotes, showing the source of his points, and in their contexts not in a “proof-texting” way. This is a nice feature of the book — that the reader can get a real flavor of the message of each of the many prophets he features, along with their historical setting, without having to look up passages repeatedly. Yet the quotes are of reasonable length. To keep this review brief, I must give only a summary sketch of the several stages of Kingdom expectation which Schweitzer traces, from the period just prior to the exile of the Northern Kingdom (mainly Galilee) and Southern Kingdom (mainly Judea and Jerusalem, over a century later in 586 B.C.E.) to the time of Paul. Concepts of the Kingdom all had Israel at the center of a new worldly arrangement involving either the punishment of Gentile nations or at least their dependence on the Jewish Kingdom under God (the God of “Abraham, Isaac and Jacob”). The author cites the progression of views on aspects of the Kingdom with their corresponding points on who God and other supernatural beings are, what God’s judgment will be, how those who have died will be handled, etc. He traces influences from outside of Israel as well as within. Isaiah is the prophet to introduce the conviction that the Kingdom of Peace will be headed by an Anointed One (Messiah) from the line of King David. Jeremiah upholds this but adds the idea of a new covenant with Israel, written on people’s hearts. He also teaches what other prophets after the return from exile do, that Gentiles will ultimately be treated compassionately by God and be able to participate in the Kingdom, assuming they accept and worship Israel’s God. In this chapter, which is about 1/3 of the book, Schweitzer also analyzes the introduction and uses of additional terms and concepts often passed over or misunderstood in reading Jesus’ or the Gospel authors’ use of them. These include Suffering Servant, Son of Man, resurrection of the dead and the pre-messianic tribulation period (prior to the final Kingdom of God). Next comes “The Kingdom of God in the Teaching of Jesus”. One main point of several in this chapter is the affirmation of this historical theologian’s long-held position that Jesus did believe he was the Messiah but that he made no public pronunciation of it. Only his closest circle of disciples were let in on the “secret”. The Gospel of Mark, which Schweitzer (with most scholars of his time and since) calls the earliest, focuses often on this factor, puzzling scholars through the ages. Schweitzer’s explanation of the final “Passion” evening of Jesus’ life in light of this and Jesus’ messianic understanding clears up some otherwise murky statements from the Gospels. Jesus’ views were based, he says, not only on the early prophets but also on ideas developed in later prophets in our current Bible and others, up to nearly his own time. One point I found of particular interest might be easily missed because of its brevity and that it is placed in a footnote. (Interestingly, most of the footnotes point back to previous sections, noting where a given subject had been introduced or developed further… a helpful tool for serious readers.) That point is a change in Schweitzer’s view of Jesus’ understanding of his death. He notes that while writing the various editions of his The Quest… he had believed that Jesus, “… in accordance with the [Suffering] Servant passages, regarded his vicarious sacrifice as an atonement. As the result of further study of late Jewish eschatology and the thought of Jesus on his passion, I find that I can no longer endorse this view.” (p. 128, emphasis mine). He does develop reasons for this understanding in the text. The final two chapters are “Primitive Christian Belief in the Kingdom of God” and “The Kingdom of God in Paul”. In characteristic succinctness, Schweitzer shows how all he has concluded about Jesus’ view of the Kingdom and his role in it carried over into the earliest form of Christian faith. To the same grounding belief in the immediate coming of the Kingdom, preached by John the Baptist and Jesus, is added, after Jesus’ death: “…belief in his Messiahship. The believers know… that he regarded himself as the coming Messiah…. To primitive Christian belief, and it is important to take this into account, Jesus was not the Messiah during his earthly existence. He became it only in the supernatural state that he acquired through the resurrection…” (p. 131). In subsequent sections on resurrection beliefs and the nature of Jesus’ appearances, Schweitzer yet again impresses me with insights and explanations of puzzling aspects of conflictual accounts of the post-burial/appearance period which to me make sense of these accounts better than other explanations, of which I have read many. This matter and that on atonement are examples which alone are worth getting and reading the book for. But there are many, many additional points of value. A refreshing thing about Schweitzer’s work is that it is appears to come from an independent mind, but not one that seeks novelty for novelty’s sake, or for notoriety. He remarkably allows the texts to speak for themselves and give a detailed picture without falling to the naive belief that they are somehow always accurate or must be harmonized because they are revealed accounts containing a clear and authoritative “deposit of faith”. Throughout the whole book, Dr. Schweitzer has refrained from any hint of preaching or suggesting applications for our individual or collective faith. On the final page he allows himself to go there briefly: “For centuries Christianity looked for [the Kingdom which would come of itself] in vain. It could not easily come to terms with the fact. It had to try to understand what could be learned from it…. The task was laid upon it of giving up its belief in the Kingdom which would come of itself and giving its devotion to the Kingdom which must be made real” (emphasis mine).